[ Editor’s Introduction: Over the past few weeks, members of the “official 9/11 groups” have come forward — years late, no new ideas, nothing to offer. The real 9/11 report, initially released by the Russians, now supported directly by both the team that wrote it at the U.S. Department of Energy and the IAEA, have been following the aftermath of their revelations. The text below is theirs. When they talk of “morons,” these are America’s top nuclear physicists, the people who build the bombs that supposedly keep us safe at night making these observations. When it is published in Veterans Today, it is here because we are also nuclear weapons officers, NATO nuclear commandos, weapons assemblers and, while VT Editor Clinton Bastin was still with us, the editorial home for America’s top nuclear weapons designer. We are intelligence agents, nuclear weapons experts, academics, spies, engineers, military officers — all unpaid, all standing against the pattern of deceit, of secrecy and of horrific injustice. For two months now, we have published the most advanced weapons physics papers ever to be made available to the public. We have answered challenges, we have learned lessons ourselves, read Khalezov’s works, basked in his insights, but we have done more as well. In Khalezov, we find the unseen hand of someone working with him. We see an agenda, and we see both brilliance and great cleverness. Moreover, in groups like Architects and Engineers for 9/11, we see something else. We don’t like it. We see dogma, ignorance, deceit and bullying. We see cheap propaganda, and we see several wolves in sheep’s clothing among them. We have been the victim of a great resurgence of activity on their part — childish attacks, bad science, misrepresentation and time-wasting. As we see it, much of 9/11 is solved. We use best evidence, best science. and when and if better science comes by, we reassess. After all, we are not insane, we are not incompetent, we are not petty narcissists, we are not amateurs, we are not A and E 9/11. Comments will be reviewed by some of the world’s top scientists. Questions answered. Input is desired. VT has readers with nuclear weapons backgrounds, with advanced experience and their comments are welcomed. One more thing: We are also intelligence professionals. When amateurs try to deceive, we smile. No bread crumb could ever leave a trail so clear, a trail so needed. We thank the thieves, the liars and the fools for their hubris. 1. Where was the sound of the jets hitting the building. How loud was that? 50 floors up, over 500 feet above you and over 1500 feet from the TV cameras. 2. Where was the sound from the cutting charges exploding. 3. Where was the sound from the nano thermite going off. 4. How loud was the sound of the collapsing buildings. 5. If you are over 500 feet below the sound at street level and over 1500 feet away, sound travels up and out. You don’t hear much. The same with the shock wave. 6. All underground explosions took place 50 feet below you and 1500 feet or more from the cameras. You get a shock wave traveling thru the ground, with a dust blast from the over pressure of less than 6 psi for a small 1.5kt nuke. Just as happened. That’s about 8 million cubic feet of space destroyed in less than 3 seconds. 40,000 tons of steel just disappears in less than 3 seconds. What does that? Godzilla or King Kong? Just look at the pictures. 7. The smaller buildings were dropped with single nukes placed in the lower level of the parking garages or in the utility tunnels running under the parking garages, as Dmitry said. Building 1 and 2 had at least three nukes planted in them. 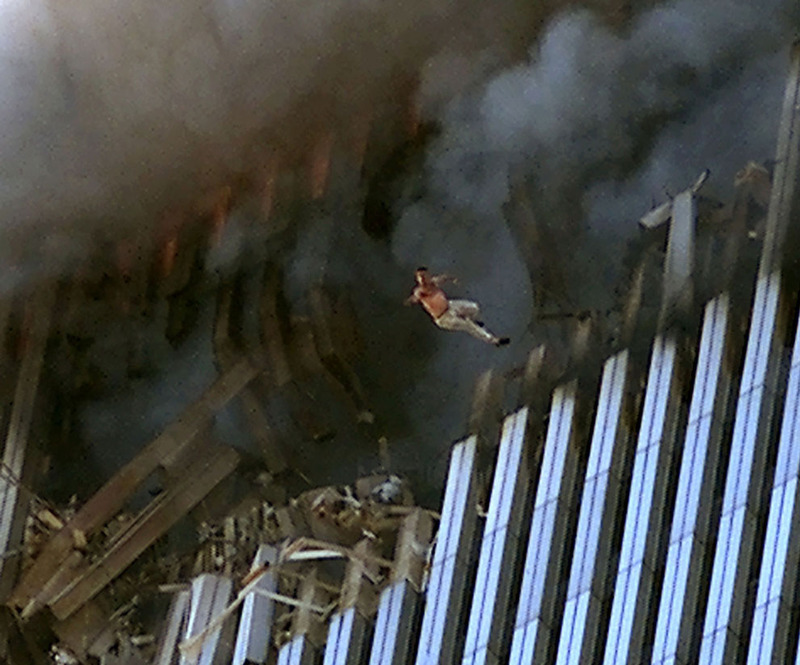 1 at or above the 50th floor, as seen in the blast photos that took out over 20 floors, and the second one placed in the sub-basement or parking garage. 8. The third really big one was placed over the air conditioning Freon storage tanks in the utility room, or just under it in the utility pipe gallery, as stated by Dmitry. This one made the giant crater formations left under the buildings foundations and was the cause of the melted steel and thermal effects seen on 9-11. 9. When the 1.5kt nuke went off next to the storage tanks containing 26 tons of liquid Freon, it turned it into Hydrogen Floride (H2F), or in the nuclear weapons industry, it is called Deuterium Fluoride (DF), the stuff that hydrogen bombs are made of. This produced the desired thermal effects needed to vaporize the central core and over half of the twin towers in less than 10 seconds. No other explosive device could do that. Dmitry was off only on the size of the weapons used, but all other data checks out correctly. He was too correct, so his source was an inside player. This is why D.O.J wants him!!!! …As in the IVY Mike nuclear Pacific test in 1952 of the first Hydrogen Bomb — producing the massive over yield due to the extra Freon being converted into extra Deuterium. On 9-11, this acted as extra external “Deuterium Boost Gas”, boosting the Thermal Yield of the 1.5 KT weapon at least 10 to a maximum of 100 times. 15 to 150 KT thermal output not in blast energy. That would put the overall “thermal energy” released between 15KT and up to 150KT at 100% efficiency. Most likely closer to 10% efficiency would be more practical. This is a crude Teller “Lair Cake or Alarm Clock” boosted nuclear fission design only used back in the 1950′s test shots. Dmitry’s claims of 150 KT thermal was a bit too big. However, if the weapon had been twice this size — 3KT vs 1.5 KT — it would have taken out the lower half of Manhattan, including the entire Wall Street financial district, and the fallout would have taken out half of NYC and not by accident!!!! It was designed that way. Over 90% of this energy is released as fast neutrons and Infrared energy, with accompanying Alpha, Beta and Gamma radiation. Less than 10% was in mechanical blast energy or over pressure. Most of this was absorbed in the ground as shock waves and created the massive cavities left below the buildings. The off-centered large cavity was located just below the Freon cooling plant storage tank location, which is a big forensic clue as to the energy source used on that day. The mostly unburnt and highly-ionized Deuterium Fluoride gas (Formally known as Freon-12) produced by the blast, (over 20 tons of it) was trapped in the building debris piles and accounted for all of the post 9-11 thermal effects of molten steel, hot spots, and out-gassing of very caustic gasses, ETC. This stuff, due to neutron excitation and very high ionization levels, will stay very hot until the appropriate neutron-absorbing chemicals are added to the ground in order to stop the ongoing low level neutron chain reactions from occurring, similar to what is happening in Japan with their nuclear 911 disaster. Fukushima was probably done by the same people too, as Dmitry states in his book. The UV light-absorbing chemicals were well documented as being used to cool Ground Zero. They would not have used it unless there was a reason, another forensic clue to nuclear weapons use on 9-11, in order to shut up the “Thermite Sniffers” and the “Audio Blast Dummies” from the “Dictatorial A&E911 Misdirection Group”. This was a nuclear thermobaric weapon that was used on 9-11 and not a conventional molecular explosive-based weapon (TNT, Thermite) that works by rapidly producing an expanding hot gas at very high velocity. Its blast effects are atomic and not molecular in nature. The physical and mechanical effects are totally different from the use of high explosives. Its purpose is to melt and vaporize as much of the target as possible by thermal radiation effects and not to blow it apart. It is an underground sub-surface blast that is trapped or channeled up the central core of the building, acting as a directed energy weapon. So over sound and pressure is directed vertically up as shown by the dust clouds produced that day. If you are over 1500 feet away and the blast is 500 feet up in the air, you are not going to hear or feel much due to the direction of the shock wave and its dispersement. Anyone who has ever been in combat and has been shelled knows this about blast effects. If not, please download and read “The effects of Nuclear Weapons” book available on the internet for free, or you can get a used copy on eBay. Then make you decision as to what was used on 9-11. Was it Godzilla VS King Kong, Batman VS Spider Man, Aliens Vs Predators from outer Space, Directed energy weapons, Thermite, Cutting Charges or Mini-Nukes that did it? Unlike A&E911, you are free to believe whatever you want. We are not here to push a false agenda. We only want to educate the world in the use of nuclear weapons so this can never happen again. Since 1992, over 50 micro nukes have been detonated around the world, and the same group of state-sponsored terrorists that did 911 did them all. Victor Bout was a key player in this false flag movement that only benefitted Israel and no one else. Since VT Today has disclosed this information and V. Bout is now in permanent US custody, the bombings have stopped.